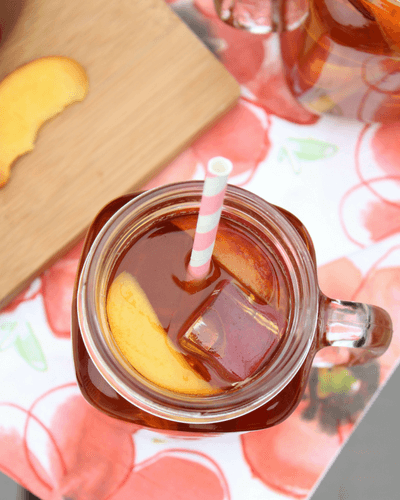 Peach Iced Tea with fresh, ripe peaches and delicious tea with sugar to sweeten up your day. 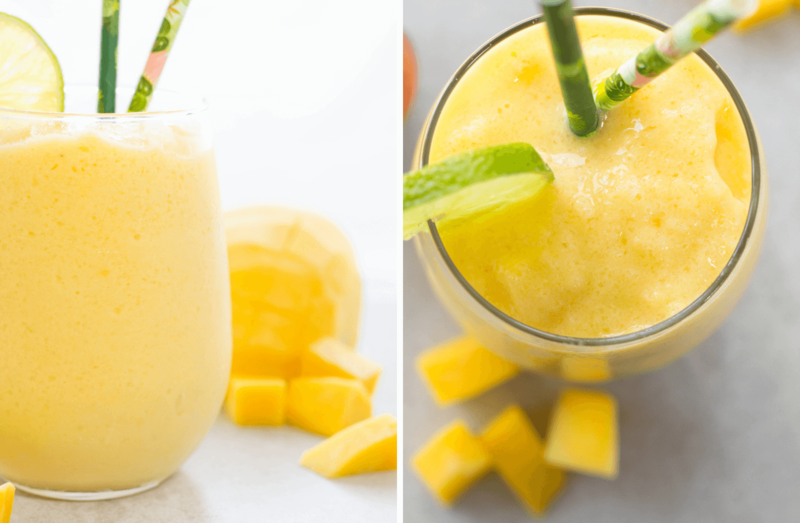 So simple to make and so refreshing with these warmer days ahead! Come May, peaches will be in season and I will be making peach everything! 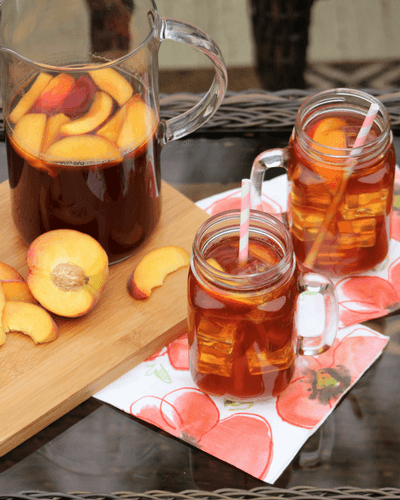 One of my favorite recipes for fresh peaches is this Peach Iced Tea. Since moving to Cincinnati, I have become a big fan of sweet tea. Although, I still think people out this way like their tea a bit too sweet. I typically will order half sweet/half unsweetened in restaurants. You can adjust the sugar level a little bit on this recipe. 1 cup is my max sugar level I would ever go for this and it is sweet for sure. 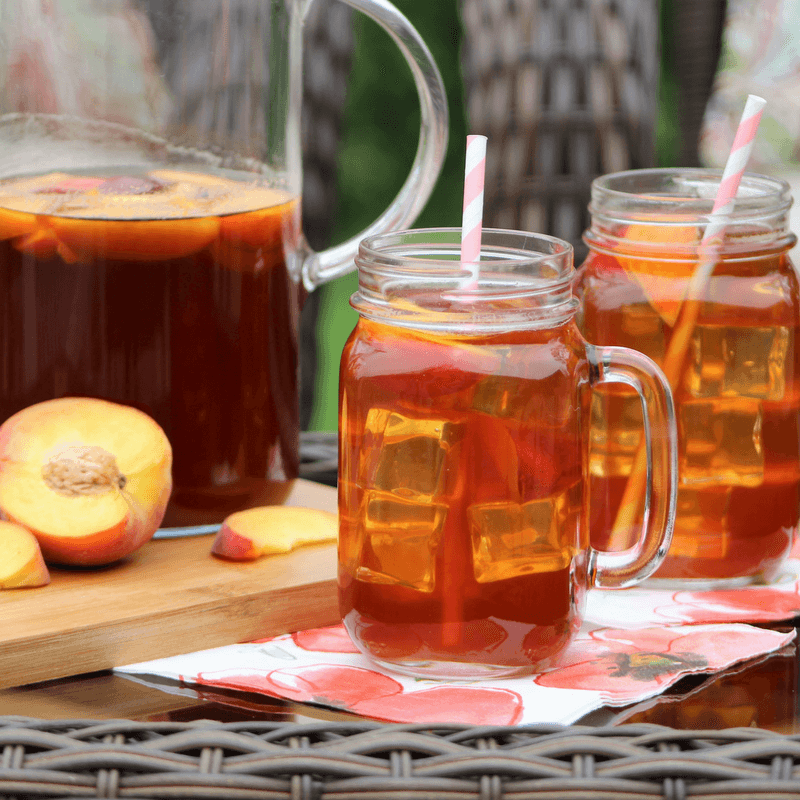 If you do not like sweet tea, cut back to maybe 1/4 cup sugar and let the peaches do the sweetening. What type of tea should you use? I think anything will work. I wouldn’t go for anything fancy. I buy the tea bags labeled for iced tea use and they work perfectly. 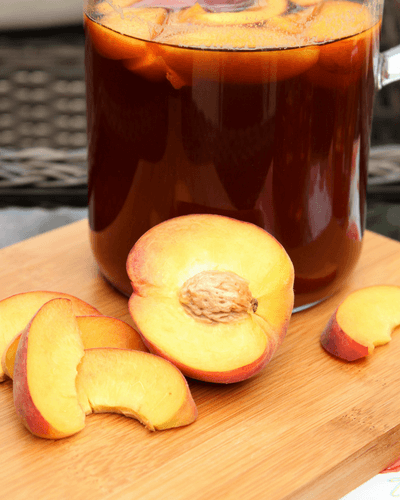 All the wonderful flavors come from the peach reduction and is just so delicious. I don’t think you could ruin it from the “wrong” tea. For your peach reduction, you will be simmering 3 sliced peaches with some sugar and water for 30 minutes. Give the peaches a good stir and squish down the fruit every once in awhile. Send the mixture through a strainer to remove all the chunks and skin and you are done. I let the tea and peach reduction cool down before adding to the pitcher. Pour over ice and serve. This Peach Ice Tea recipe is really fantastic to serve for guests. Everyone will be saying how great this fresh tea is…. you don’t have to tell them how incredibly easy it was. On the stove top on medium/low heat, add your sliced peaches, 1 cup sugar and 1 cup water. Let peaches simmer for 30 minutes. Use a muddler or the back of a spoon to squish down the peaches to get the most juices from them. Mix often. 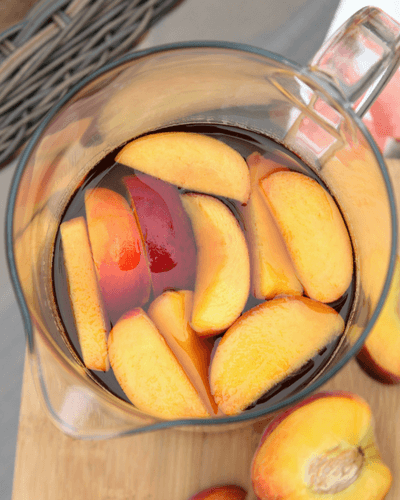 Use a sauce to strainer and pour the peach reduction through into a large pitcher. As the peaches are cooking down, make your tea. Place 3 tea bags into a pot with 7 cups of water. Bring to boil and let seep for 10 minutes. Pour peach tea over ice. You can add extra sliced peaches into the tea if you wish. 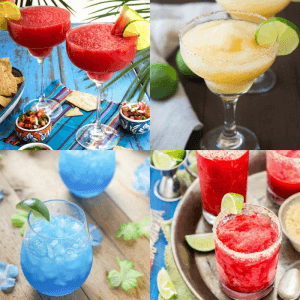 Inspiration for this margarita round up came from the upcoming Cinco de Mayo that is around the corner! I love any excuse to eat Mexican food and drink a frozen margarita! 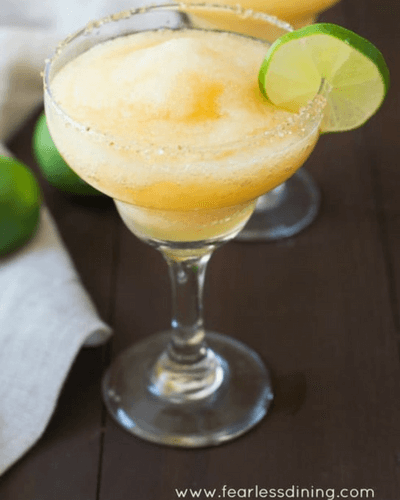 Here are 15 ahh-mazing margarita recipes from some of my favorite food bloggers. The Strawberry Margarita Granita from Sugar Spun Run because adult need slushies too. 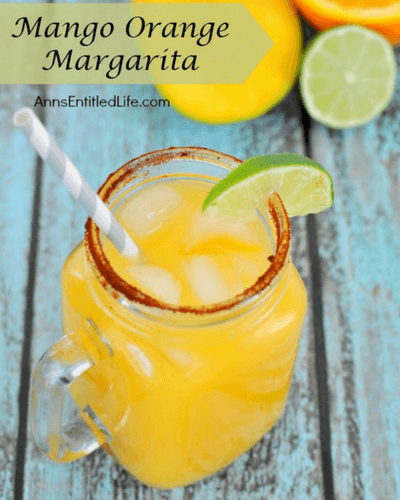 Mango Orange Margarita from Ann’s Entitled Life and take your taste buds around the world with sweet, spicy, tart and tangy. 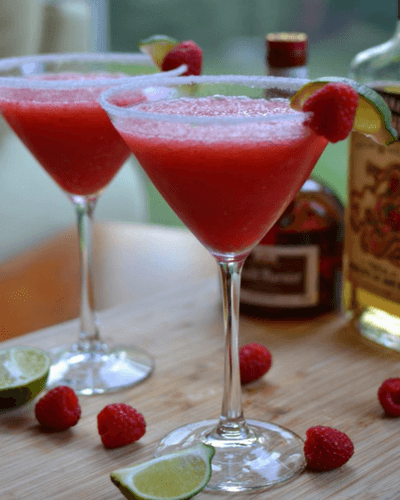 Raspberry Margaritas from Small Town Woman. 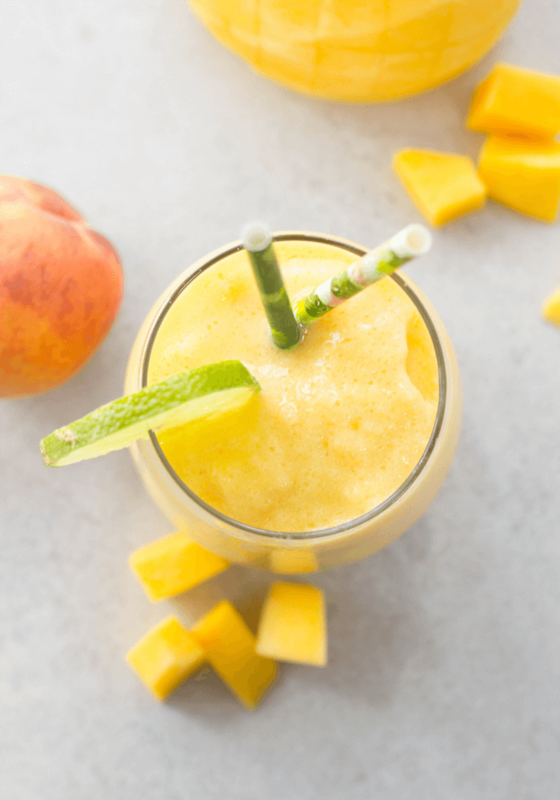 Frozen Peach Margarita with Ginger Sugar from Fearless Dining. Ginger sugar rim…. yes, please! Blue Margaritas from Baking Beauty. 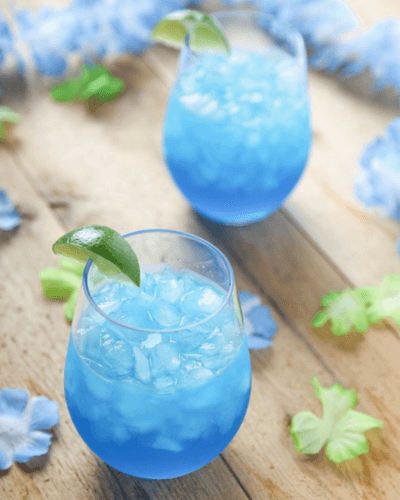 Only 4 ingredients needed to make this bright and beautiful drink! 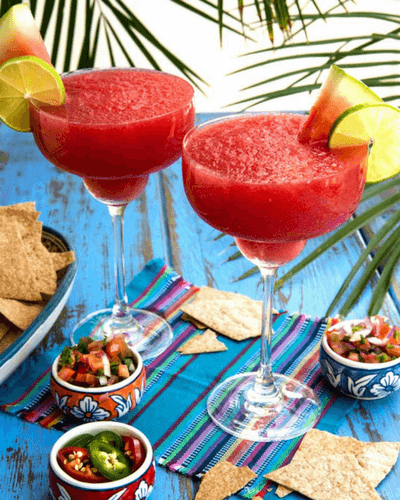 Best Watermelon Margarita from All She Cooks for the perfect poolside beverage this summer. Margarita Jello Shots from Ann’s Entitled Life. Sunburned Strawberry Margarita from Ann’s Entitled Life. Frosty Cold Beer-Ritas from Chaos is Bliss. Dewey’s Famous Margaritas from Merry About Town. Strawberry Thyme Margarita from My Wife Can Cook. Cucumber Peach Jalapeno Margarita from Making Mrs. M.
Perfect Pineapple Margarita from Baking Beauty. 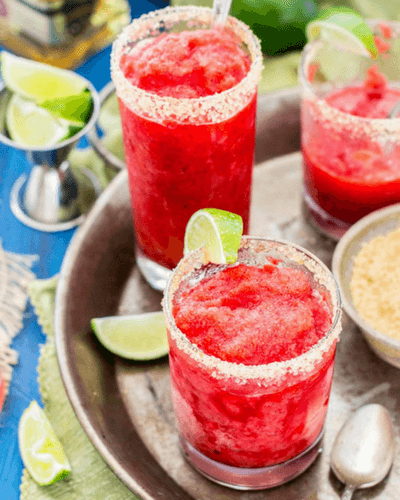 Cranberry Margaritas from Baking Beauty. Festive Cranberry Margaritas from All She Cooks. 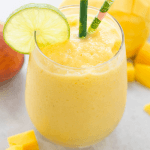 A Mango Peach Smoothie is made with fresh mango, diced up peaches, peach yogurt, ice, a pinch of vanilla extract and orange juice for a delicious drink mango lovers will rejoice over! There is just something a fruity smoothie on a hot day that is just perfect. Smoothies for breakfast, lunch or post workout snack is my thing this time of year! Start by peeling the mango a sharp paring knife or vegetable peeler. Slice a thin piece off the bottom of the mango so it stands upright. Slice the flesh off the mango leaving just the pit. Toss the pit and dice the mango into chunks. 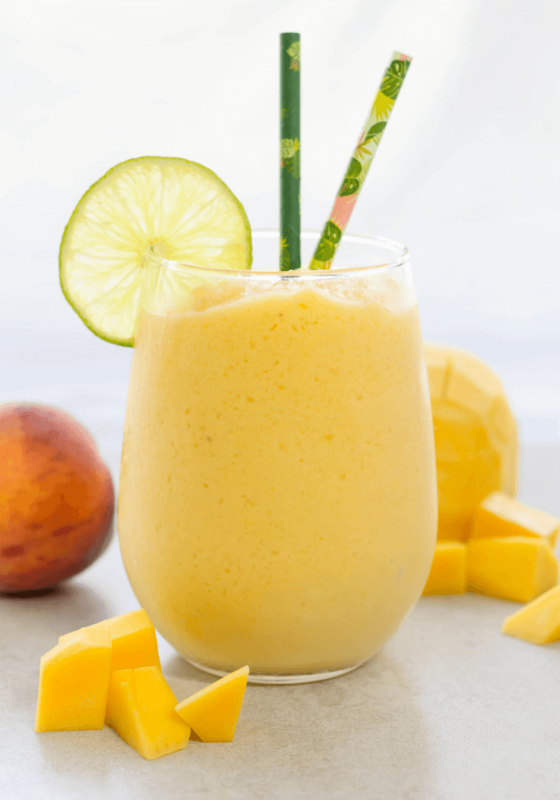 Time to get that blender out so we can make some Mango Peach Smoothies packed full of vitamin C! 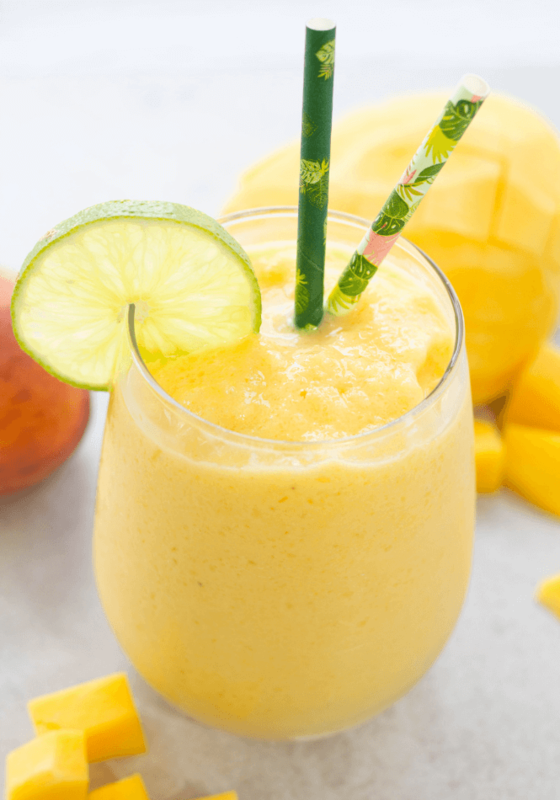 This smoothie is sweet, a tad tart and bit bitter from the orange juice. It is a great combo that is so satisfying on a hot summer day. Dice the mango and peach. Place in freezer for at least 2 hours. Place all the ingredients into blender and blend for 1 minute or until it is a smooth consistency.